Enjoy this 100% heavy-weight cotton, pre-shrunk Big Game Animal long sleeved t-shirt, professionally heat pressed with the Buck design. Choose to have the image printed on the front or the back of the shirt. Available in a variety of tshirt colors and sizes, this Buck tee is sure to be a hit! 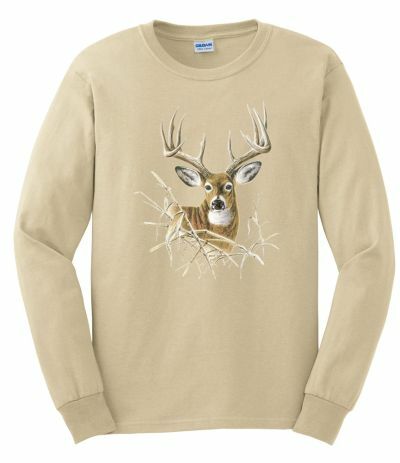 Enjoy this Big Game Animal long sleeved t-shirt, professionally heat pressed with the Buck design. T-shirt images are printed with lasting inks to resist fading. Some tshirt colors are available in extended sizes as special order. These special order shirts may take up to two additional weeks to ship and are non-refundable.